I buy alot of Steel, Stainless, and Aluminum from an outfit called ALRO Steel. They have a retail outlet in Elk Grove (chicago). They sell pieces by-the-pound (cheap) and will usually cut it for you. Just find scrap piece close to the size you need. I have made (2) luggage racks for my own bikes (1300/1800).. Mine have been quite large- as I am mounting Harley Tour-Pak trunks to them. I also have a large Tourmaster Bag, I use for traveling. Aluminum is VERY easy to cut with a small jigsaw (metal blade), and EZ to drill as well. Here is my 1300 Rack: I have since redesigned the side rails and trunk mount to get rid of the spacers, and take away some bulk. This was just a "quickie" to get the trunk mounted for a trip. 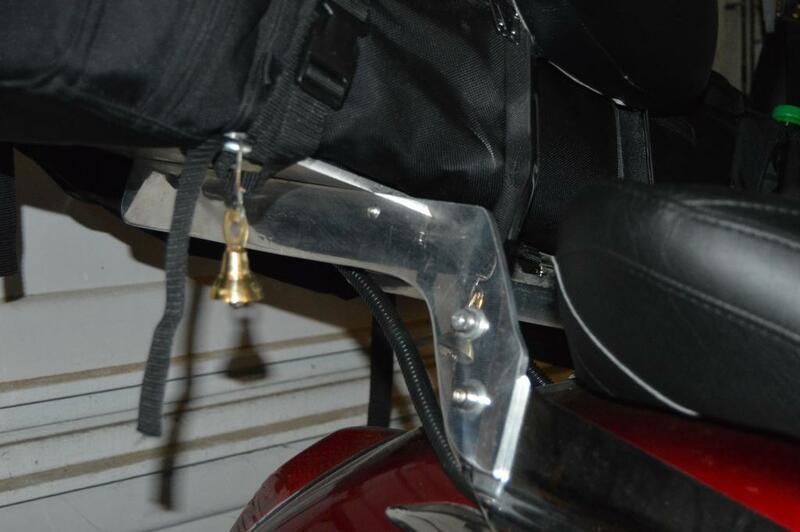 Here is the rack for my 1800: I have my travel bag on it now, as I repaint the Harley Trunk to match the bike. I made the side rails and the luggage rack with minimal tools needed. Here is how I mounted my trunk, it was one of those blow molded plastic trunks. The two mounting plates were diamond plate aluminum mounted to a stock Hondaline bracket without the sissy bar installed. Please excuse the dirty bike and trunk, those pictures were taken right after I got back from my 7,800 mile cross country trip (road grime). Baker6x6 - Thanks for telling me about the place in Elk Grove Village! Good to know because I live in the Chicago area. Are your brackets and mounting plate stainless steel or aluminum? Sparky - Thanks for the pictures! Very helpful! Also how much of the trunk (percentage) should be supported by the luggage rack/plate mount for it to be safe and secure? If I get a piece of aluminum plate how can I attach it to whatever luggage rack/bracket I end up using? You can drill through the plate and the rack like MJKLaser did.... I use tapered head socket machine screws and use a large drill-bit to countersink the heads so the rack is flat after bolting on. Also- use NyLok nuts so they don't vibrate loose. Lock-washers don't always stay tight. If you don't want to drill through the luggage rack- you can "sandwich" it between (2) plates like you suggest below (large plate on top, and smaller plate under the rack). Do I first attach aluminum plate to the luggage rack and then attach trunk to that? I prefer this... you can remove the trunk and leave the plate- in case you need to strap something larger than the trunk to it. I ride my bike to work alot, and often carry long or large parts (yes, I've carried automatic transmissions on my bike).... I just remove the trunk (4-bolts) and strap to the rack. OR do I just put a piece of aluminum plate above luggage rack ( to extend the size of luggage rack) and a 2nd plate below the luggage rack, to have something to bolt into? You can do this as well. But, you'll have to line-up a bunch of holes, and the plate will come off when you remove the trunk. My Viking trunk has brackets and very long/large bolts for mounting. I did not use any of the mounting hardware that came with my trunk(s)... and just used my own. The entire bottom- maybe 1/2" smaller on each side so it doesn't show. Basically, I cut a piece of diamond plate to fit the underside of the Hondaline luggage rack, installed a piece of rubber gasket material that I picked up at an Ace Hardware store (also cut to fit), I sat the trunk on the top of the luggage rack and drilled holes in that diamond plate corresponding to the factory design cut out in that plate so no damage was done to the luggage rack if I decided to remove the trunk. I then cut a piece of diamond plate to fit inside the trunk, extended the holes from the bottom plate up through the trunk and the diamond plate inside the trunk and bolted it all back together. I then drilled holes around the perimeter of the plate inside the trunk and through the bottom of the trunk and with bolts and fender washers was able to support the whole of the trunk from above/inside by the plate inside the trunk. Having said this, if I do this again (and I probably will), I will do this exactly the same except with a third plate sized to match the outline if the trunk sitting on top of the luggage rack and the trunk sitting on that third plate (basically creating a 7 layer sandwich of bottom plate, rubber gasket material, luggage rack, rubber gasket material, middle plate, trunk, and top plate inside of trunk. For Ray, where do you find those Harley Tour Pack Trunks and do you buy them new or used? I think that is what I will put on the bike next time. Also what kind of a light is that that you have mounted under the trunk support plate (I am all for getting as much light as I can on the bike)? Another also Ray, do you travel to this metal place near Chicago or do they ship to you? Thanks again Ray! Last edited by SPARKY5151; 04-16-2019 at 12:42 PM. The 1st Harley Tour Pak is an original used one I got from Knightrook (Jimmy)- thus my creek adventure trip. My other one is an inexpensive ABS copy. I much prefer the OEM Harley... but new ones are $1200+ and good used are $400-$800. I bought Jimmy's because it needed A LOT of work. I can do that... so it was no big deal. The light under the plate is a 3rd brake light from a VW Jetta station wagon. The import car repair place I share my building with was replacing the (wrecked) tailgate with a complete used one... so they let me steal the light. It was damaged in the creek wreck... so I took it off and bought a cheap 17-LED light for a truck and mounted it to the trunk. There are ALRO Steel places all over the east coast. There is one here in Greensboro (about 15 mi from work)... so I go there. Their "Retail Outlets" sell off their scrap pieces they can't use, so you can look through their piles of cut-offs and find what you need. You may be able to find a similar source near you, or tell me what you need and I'll get it. Sparky - what is the purpose of the plate INSIDE the trunk? Is it to give the trunk more rigidity? I've never done this before and I"m not an engineer so that's why I'm asking so many questions Also, is the rubber gasket totally necessary? I think at the very minimum I need a plate under trunk (on top of luggage rack) to extend the length/support of rack and probably a piece under the rack to have something to drill into ( I suppose I could use the mounting brackets it came with alternatively but I like Baker's idea of attaching the "extension" plate FIRST and then attaching the trunk to that! I also thought I could use some JB Weld epoxy to glue the top plate onto the luggage rack if I only bought a top plate (and didn't use one under the rack). Thanks for all the great ideas guys! I'll have to post some pictures when I get this completed! I wouldn't rely on JB-Weld alone to hold that plate to the rack! Granted it is not a Harley, but there is still a significant amount of vibration when the engine is running and while riding. For Sale: **SOLD** 1300S Modded Seat. 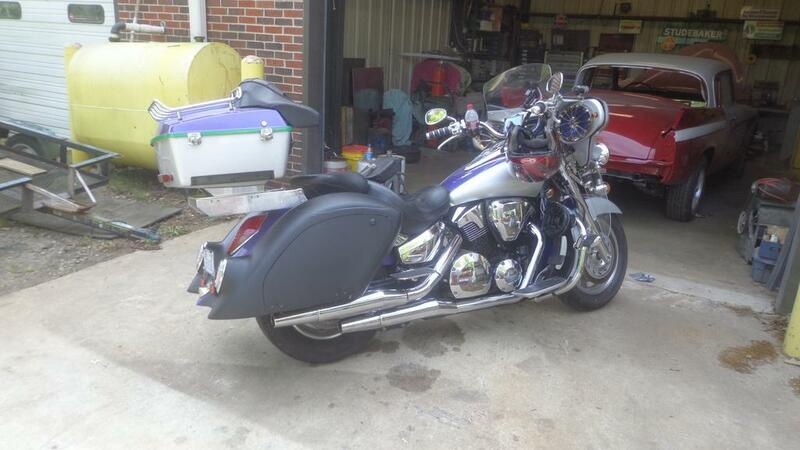 Luggage, Sissy bar and Luggage rack. 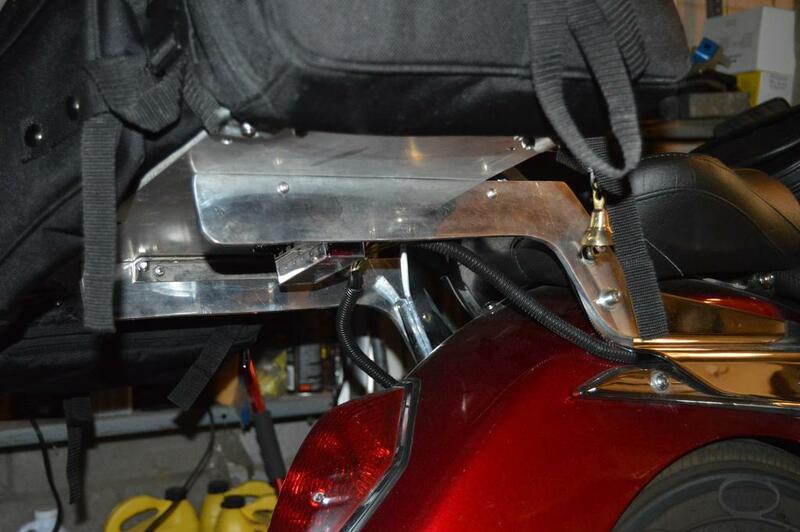 Question Dumb Question: do I need a rear fender luggage rack to use sissy bar luggage? Question Is luggage rack needed with sissybar luggage?